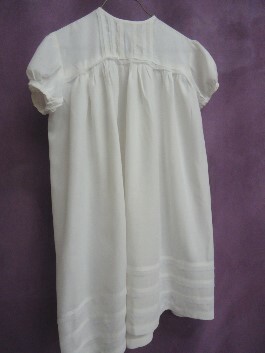 This christening gown was made by my Mom, a talented seamstress, for her first-born child in 1956. There was also a blanket that was a gift from my Aunt. The robes were worn by my sister and me. These items were carefully stored until 1977 when they were worn by my brother’s first born son and all my mom and dad’s grandchildren. They were last worn by their youngest grandchild in 1994. The family welcomed the next generation of our family in 2018. Sadly my Mom passed away in 2018 but we will celebrate her life and legacy when her first great-grand son will be christened in the robe that she lovely made 62 years ago. 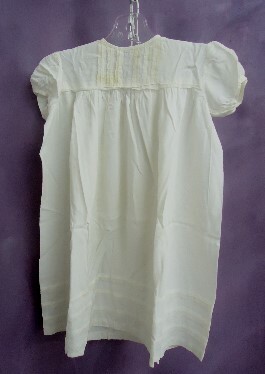 Carol’s vintage christening gown and slip had yellowed as most white garments do. The gown also had darker yellow stains on the left sleeve. The ivory and yellow wool blanket had some yellowing and holes of all sizes. 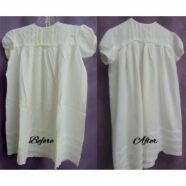 We gave the gown and slip a medium temperature chemical treatment to whiten the color and remove oxidized stains. The gown fabric was delicate and required very gentle handling. All items look fresh and ready for the new little one to wear.